At the Aries New Moon, it is time to wake up from winter’s rest, time to shed layers, time to get out and move. In honor of that energy, this new moon forecast comes a little early and will be a little shorter. I am traveling to Rome and Florence over the next two weeks. I will be looking for of Spring. The New Moon, at 16 degrees Aries, squares an opposition of Mars in Cancer and Jupiter in Capricorn. Jupiter for now is wearing the conservative garments of Capricorn. Capricorn and Cancer have been the predominant energy of the winter. Along with “pay attention to me” Jupiter, Pluto has contributed his bass tone to Capricorn as well. The chickens come home to roost in Capricorn. We ask ourselves, “How are we responsible?” “How can we assure success?” To this serious tone, Mars in Cancer has been contributing the emotional response: “I must take care of my own.” Mars’ retrograde journey through Cancer has heightened our emotional awareness of the problems facing us. Two signs in opposition (which Capricorn and Cancer are) can feel like a stalemate. With the spring, cardinal fire sign Aries enters to stir things up. Like an ice dam in the river, things felt to be stuck for a while are going to start moving. I welcome this. And at the same time, it is helpful to pay attention to where we’d like to direct this energy. Can we use it to solve problems or gain insight? To the inpatient energy of Aries is added a substantial amount of earth this month. If you work with elemental energy, can you imagine how you would like to use this potent combination of fire and earth? The Full Moon chart for April 20 has a grand earth trine (planets in all the earth signs are in harmonious relationship to each other). The Sun, at 0 degrees Taurus trines Saturn at 1 degree Virgo, which trines Pluto at 1 degree Capricorn. Grand trines can be lost opportunities if we don’t consciously engage the energy. The Moon at 0 degrees Scorpio (opposite the Sun) provides a doorway into the earth trine. This Moon is the doorway to soul and an invitation to not turn our eyes from unpleasant feelings or situations. Scorpio and death are close friends. Death can be a teacher, an ally. Death teaches us what is really important, what is essential to each of us. If you knew your essence, how could you use the manifesting energy of earth to live that essence? Beltane (May 1) is the cross quarter Sabbath that celebrates fertility, spring renewal and the joy of life. 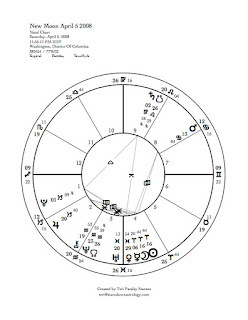 Another grand earth trine emerges on Beltane, this time involving Venus in Taurus at 0 degrees, Pluto in Capricorn at 0 degrees and Saturn in Virgo at 1 degree. And Saturn is very strong at this time as it will turn direct on May 2. Venus is the May Queen in Taurus. She celebrates the body and all life’s pleasure. Saturn in Virgo has been teaching us to bring healing order back to the world. Pluto has been showing us the shadow of authority in preparation for his challenge to us to take back the authority we have given away. Body, healing and revolution. One revolutionary act is to live in beauty and to not let any external authority tell us how to do that. Dance around the May pole with that kind of exuberance. The Democratic contest for the presidential nomination is one major event unfolding before us. The Pennsylvania primary (April 22) happens right after the potent Full Moon. Pay attention to how this Full Moon impacts Clinton and Obama. 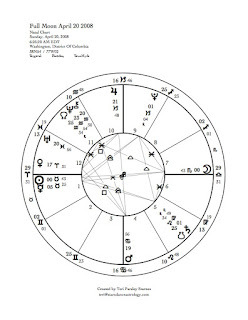 The Full Moon is conjunct Hillary’s Sun (2 degrees Scorpio) and squares Barrack’s Jupiter (0 degrees Aquarius) and Mercury (1 degree Leo). The energy of this time will reflect on who Clinton is, and will reflect on how Obama communicates his beliefs. The voters of Pennsylvania will decide based on these things. It should be fascinating and like all Full Moons, illuminating.